I find it hard to remember when exactly I met Kirsty, the designer behind Charcot, because it feels like I've known her forever. I do know that I was aware of her work for sometime before we became friends. 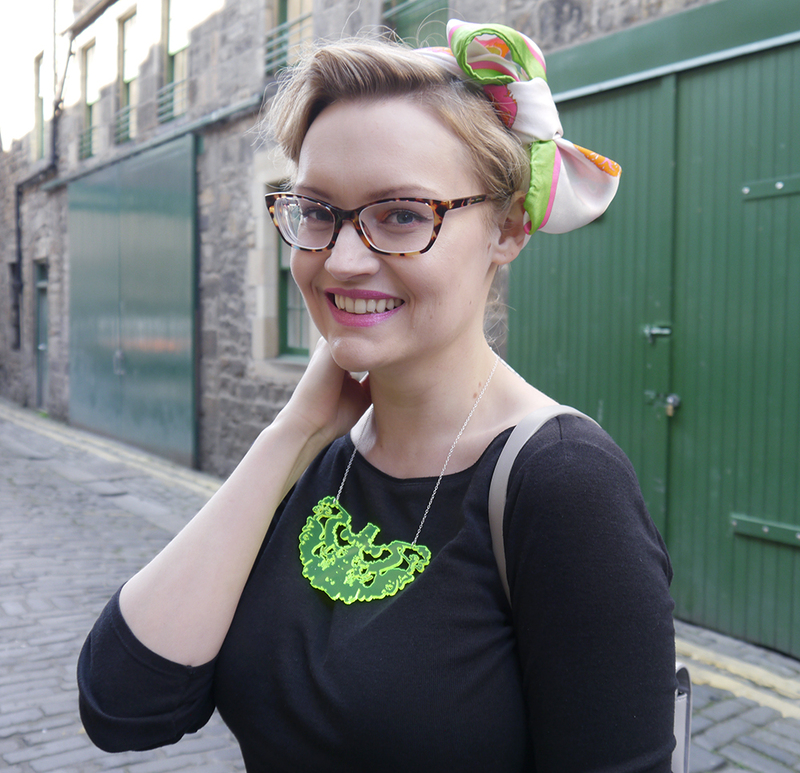 She graduated in jewellery from DJCAD. 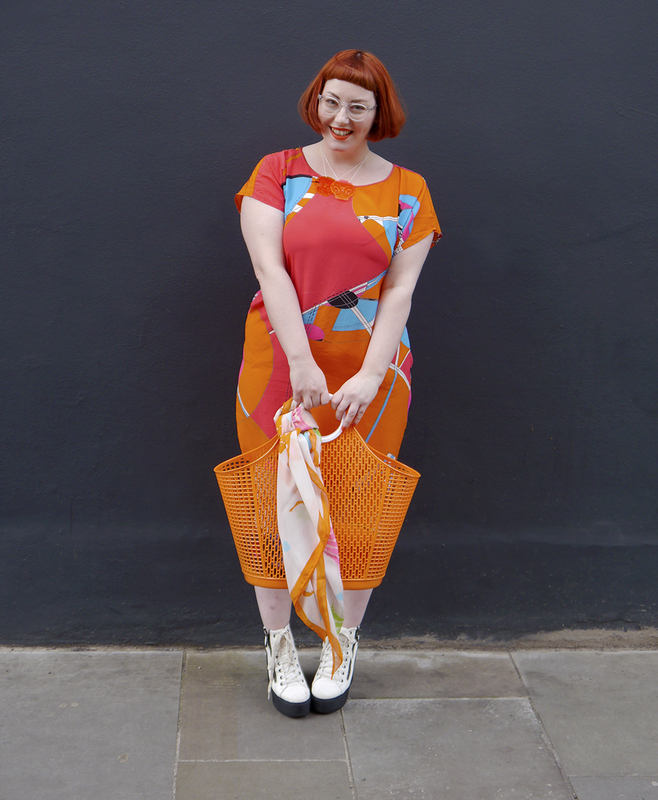 Now, I always try to pay attention to the designers displaying during degree show time but Kirsty's work stood out to me because her designs were all based around Multiple Sclerosis (MS). 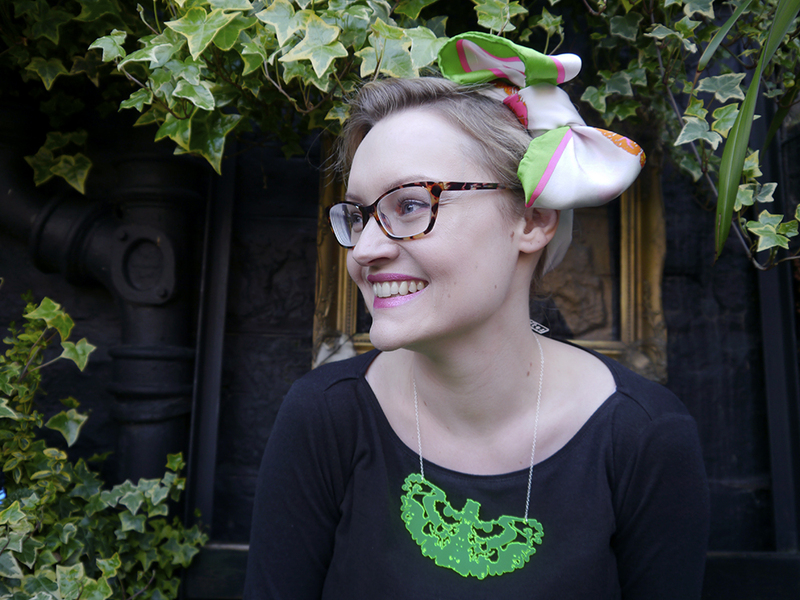 My mum suffered from this autoimmune condition so I've seen the difficult effects it can have and seeing it used to create unusual, statement jewellery certainly made me curious. 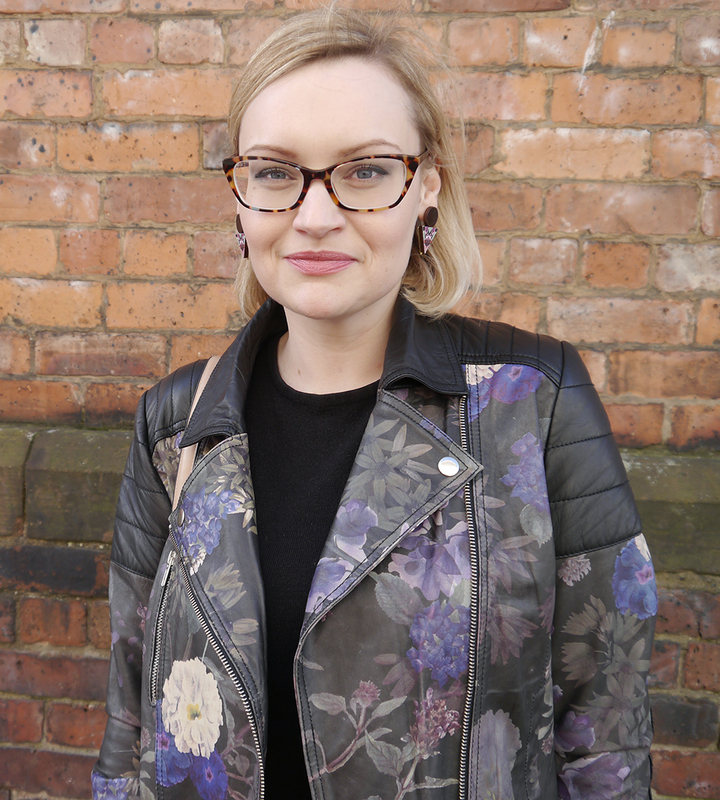 Kirsty was diagnosed with MS in 2007 and decided to take this news and turn it into something positive. All of her designs are based on the lesions, caused by MS, that show in her MRI scans. She takes these dark shapes and turns them into intricate and interesting designs and patterns. 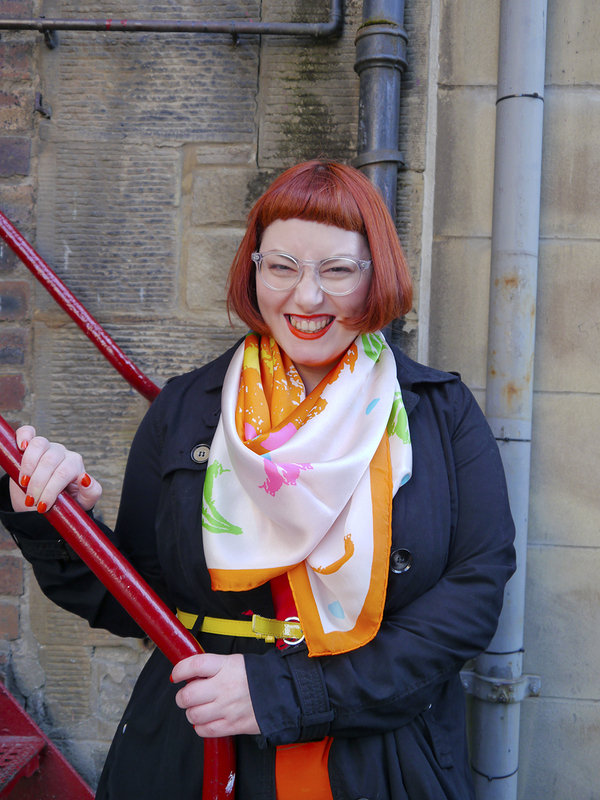 As well as creating beautiful jewellery, prints and scarves out of these shapes, she also works to raise awareness of MS, with a percentage from each sale of her work goes to the MS Society. 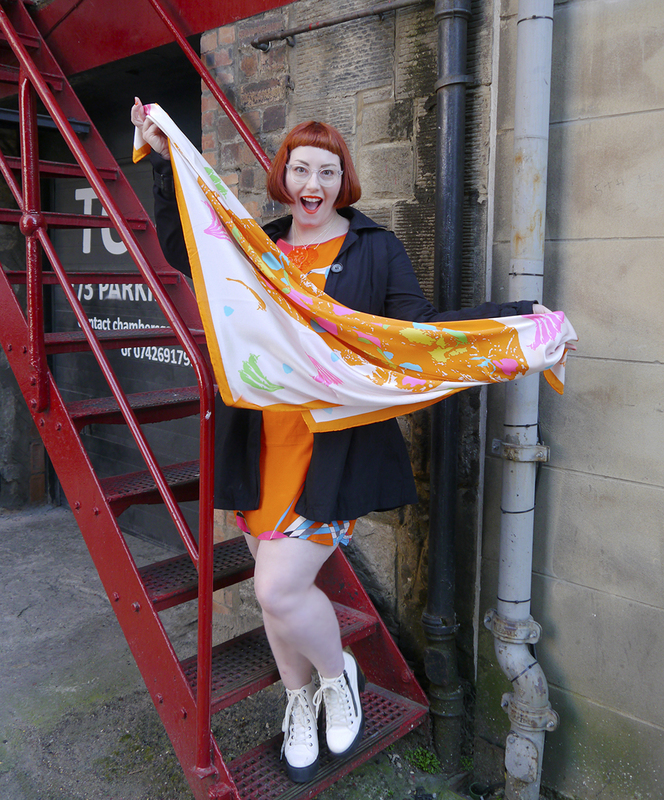 With the 24th - 30th April being MS Awareness Week it seemed like a great time to dress up in Kirsty's striking designs (something I've been wanting to do for a while) and do our little bit to raise awareness. 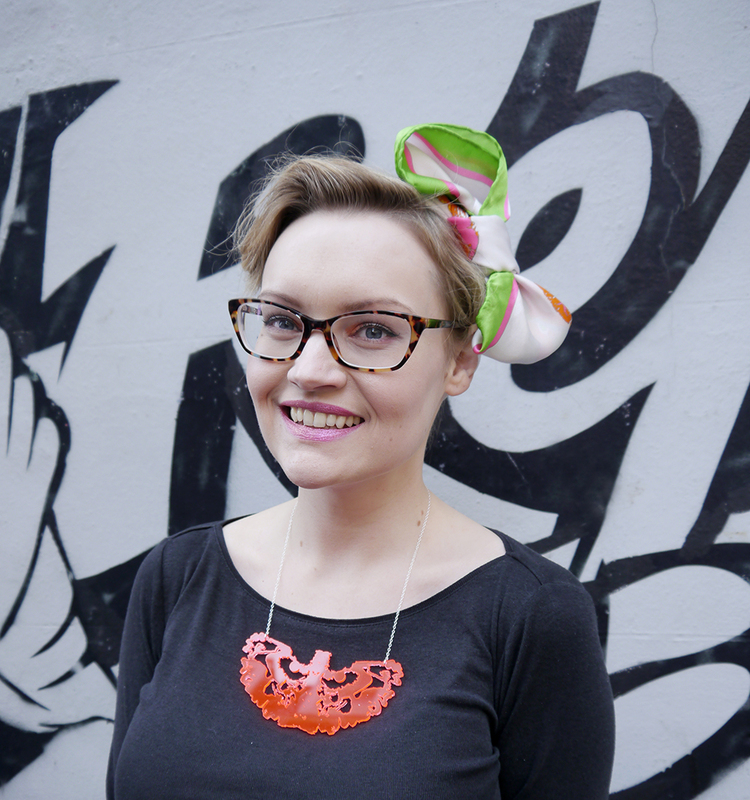 Starting in jewellery, Kirsty has since expanded into printed textiles. 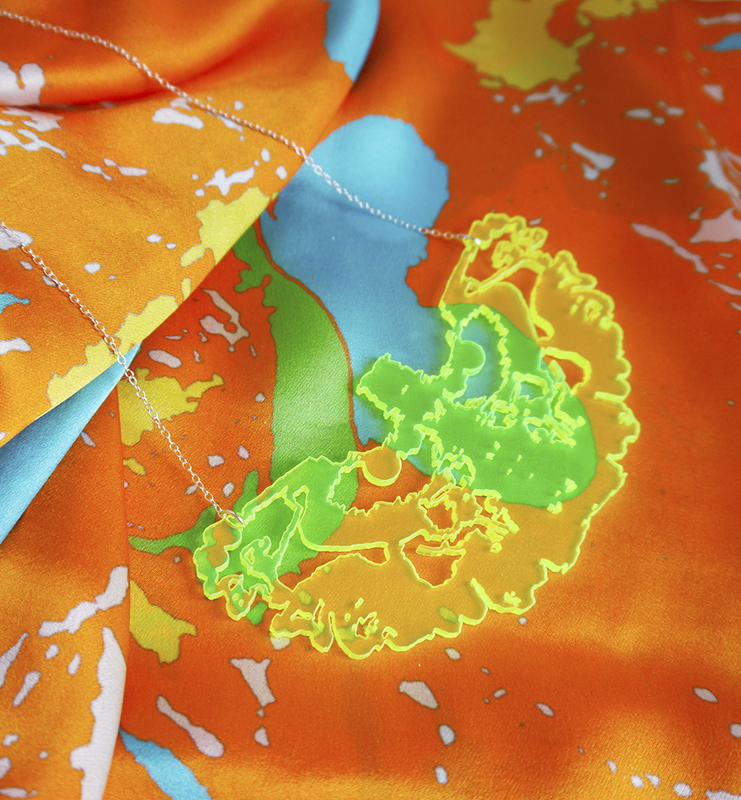 Her collection now includes bright statement necklaces and beautiful silk scarves in a range of neon colours. 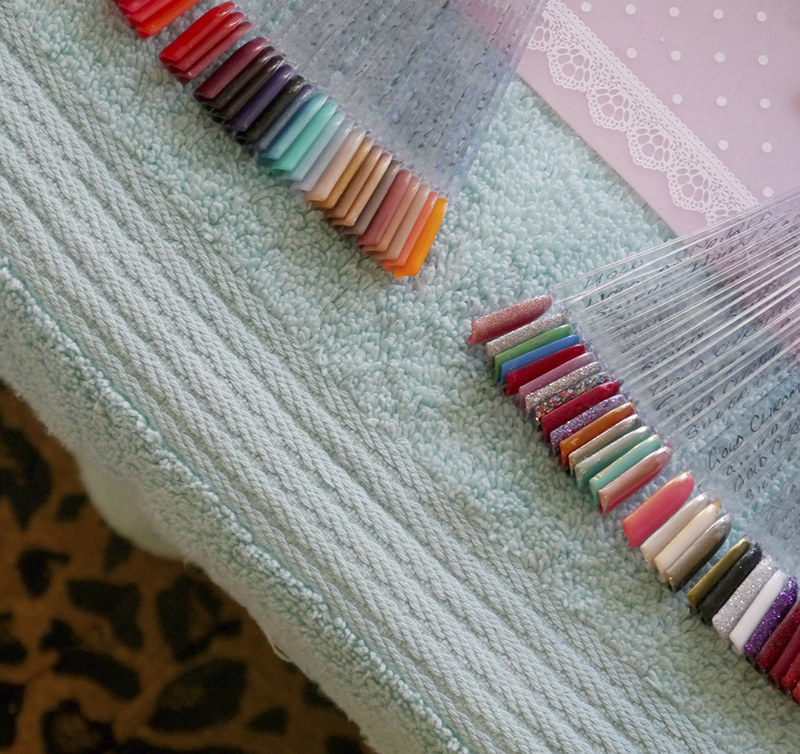 In fact, she's just been working to add a couple of new colours to her collection. 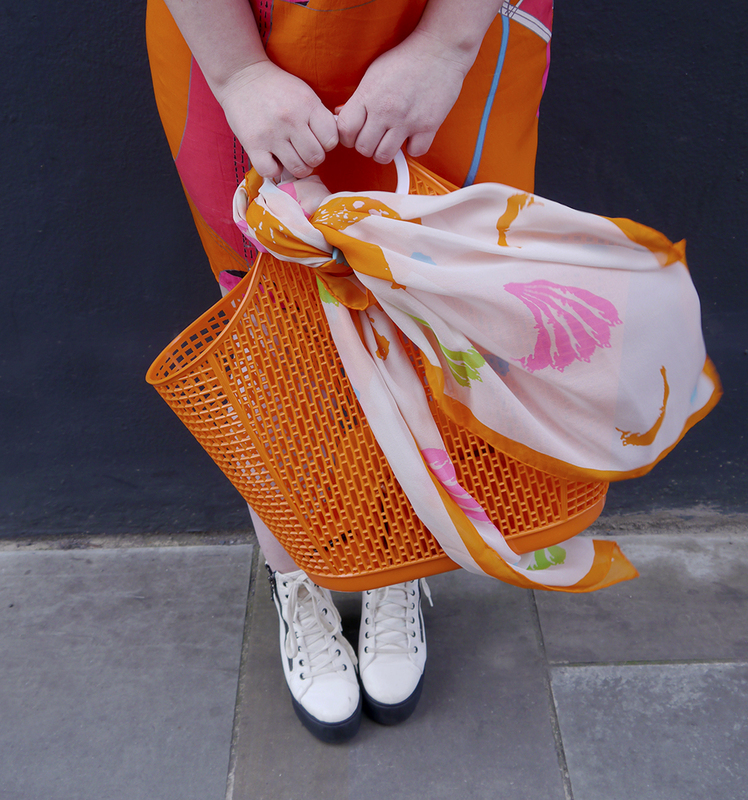 Hello bright pink, deep orange and mellow yellow! They are a great way to add a pop of colour to a plain outfit or, if you're me, add more bright hues to an already rainbow look. 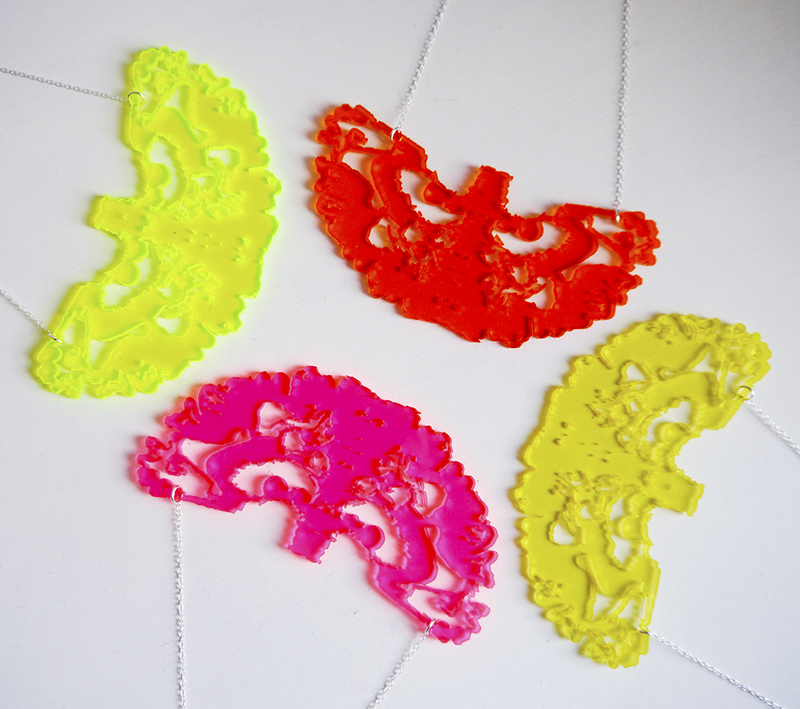 The more colours, the merrier and with these the neon acrylic is so bright that it looks like the edges are glowing! 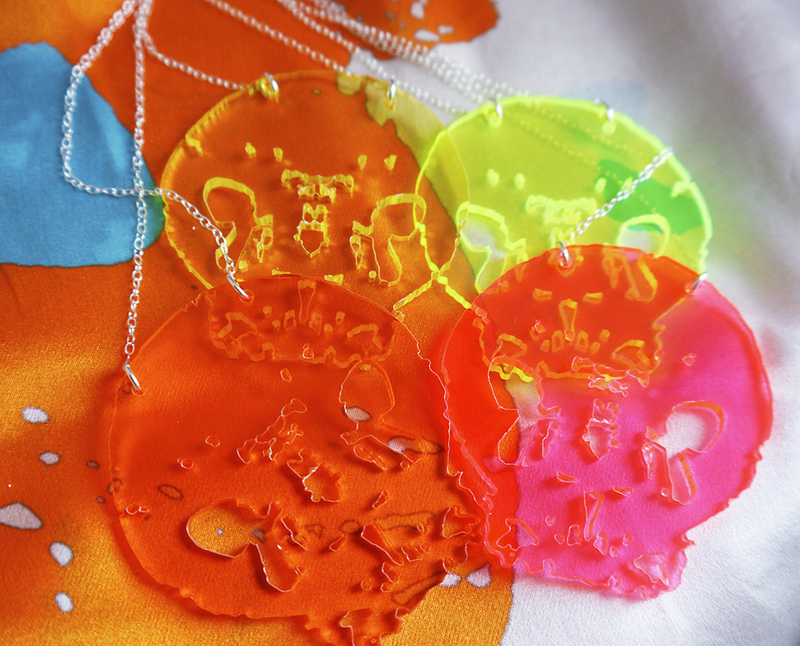 I love how Kirsty has used the lesion images to create other shapes in the necklaces. 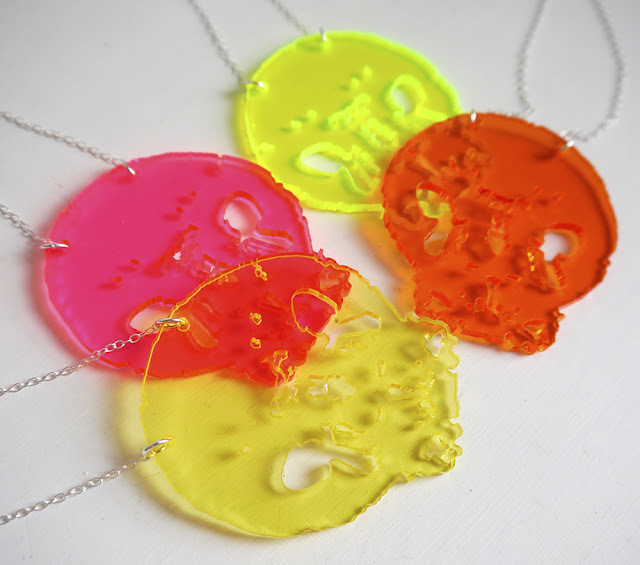 These ones look like skulls, adding a tougher edge to the bold, cheerful colours. 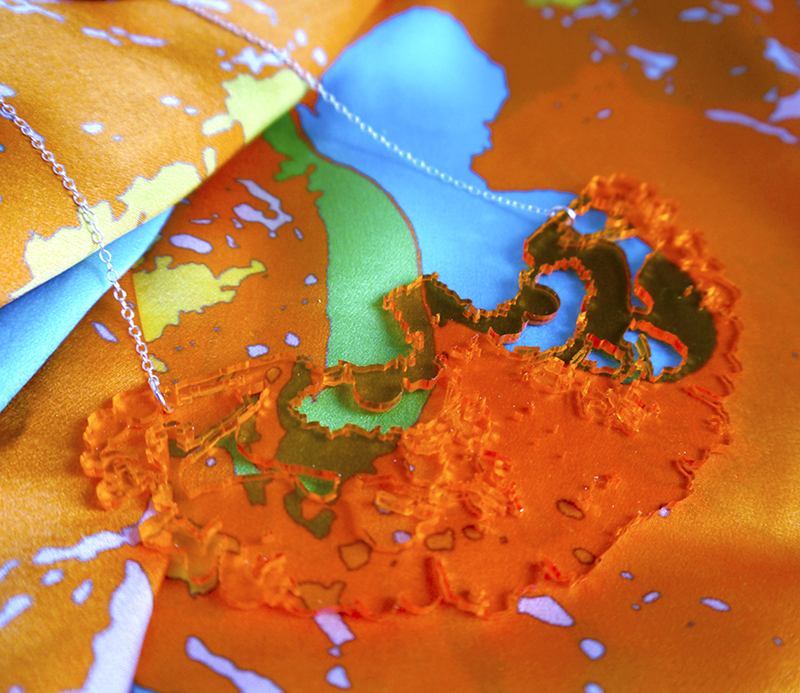 While on her scarves they look fans, flowers and more abstract shapes. All round, it's a great collection that I'm totally on board with and would be, even if I wasn't aware of the deeper meaning behind the designs. MS is a condition which effects the brain and/or spinal cord and can cause a number of different symptoms, including fatigue, pain, vision problems and mobility issues. It happens when the immune system attacks part of the body, mistaking it for a foreign substance. Not much is known about why people develop MS and there currently isn't a cure for it, but treatment has come a long way over the past 20 years. You can find out more about it via the NHS, MS Trust and the MS Society and there are plenty of ways you can get involved during MS Awareness Week. If you can, I'd love it if you could donate to the MS Society and support the research and work they do to. 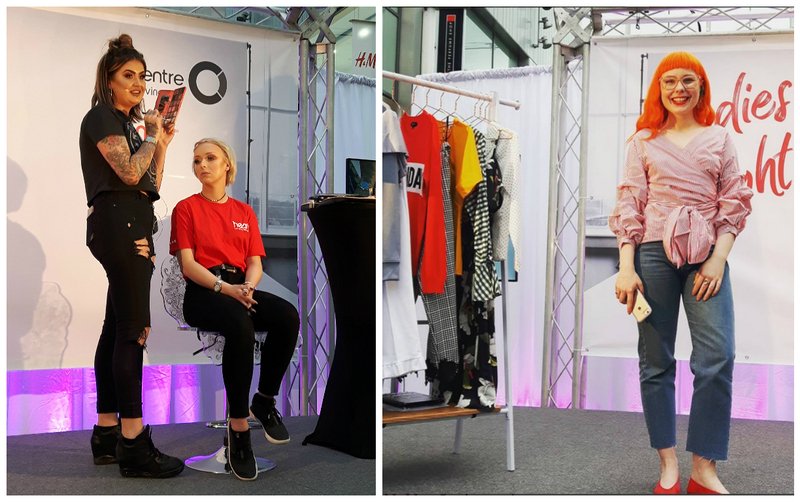 Check out Kirsty's work via Instagram, Facebook and Twitter, buy here work here and watch out for her new website coming soon! 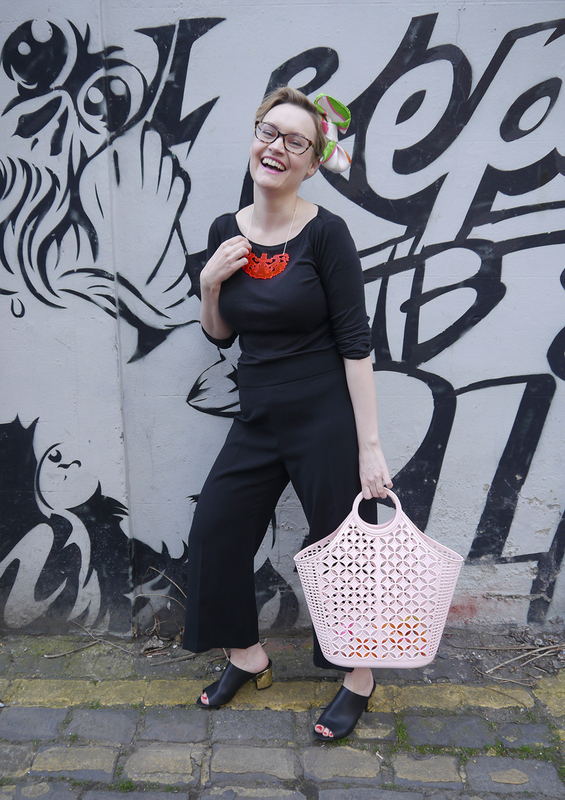 Kimberley and I both love rocking a vintage look, so when PinUps Vintage got in touch to ask us over for a makeover we jumped at the chance! 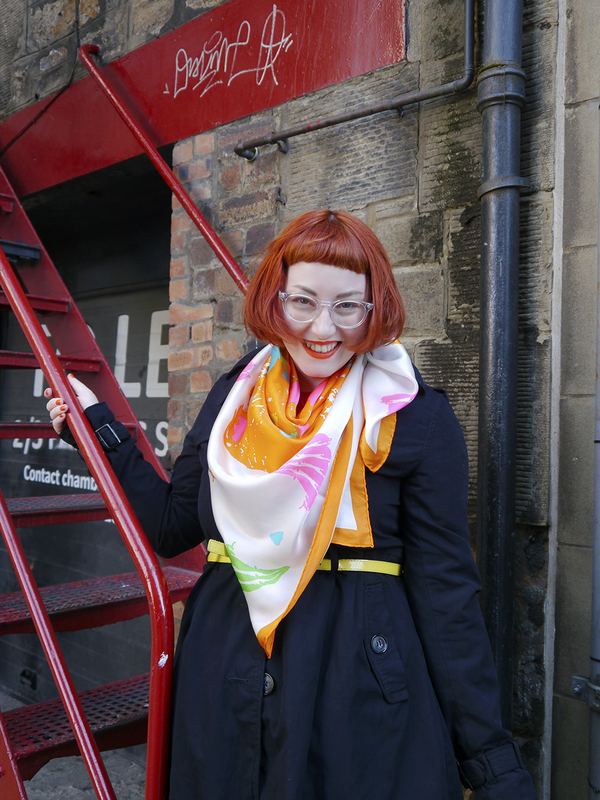 After our Sun Jellies adventure, we made the most of being in Glasgow and popped along to their West End salon. 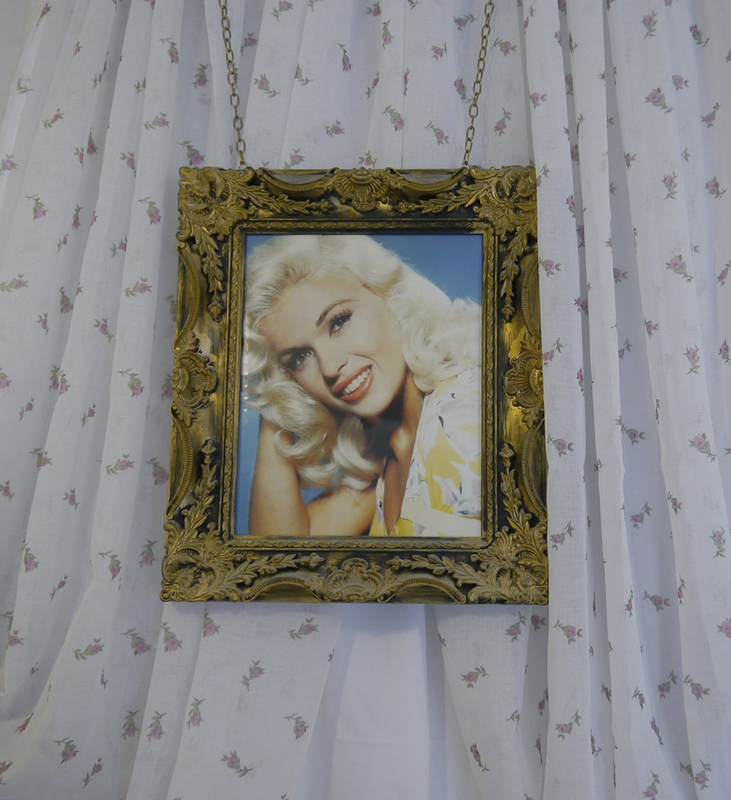 I hadn't heard of PinUps Vintage before going along but it turns out they've been around for a while (the salon was established in 2014 but they've been in the business for more than 20 years! ), tucked away on Ruthven Lane. 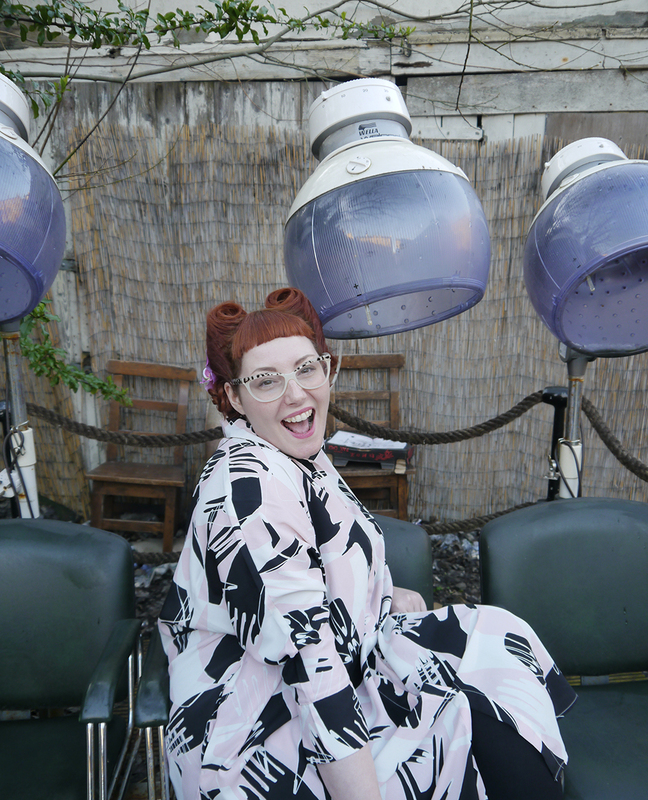 The vintage salon chairs outside mean it's easy to spot when you start looking. The salon itself is teenie but it has everything required to make you look fabulous; from a nail bar to make-up chair and a couple of hair stations. They've even squeezed in a comfy sofa area and a fabulous vintage reception desk. The place is decked out in full on shabby chic style. 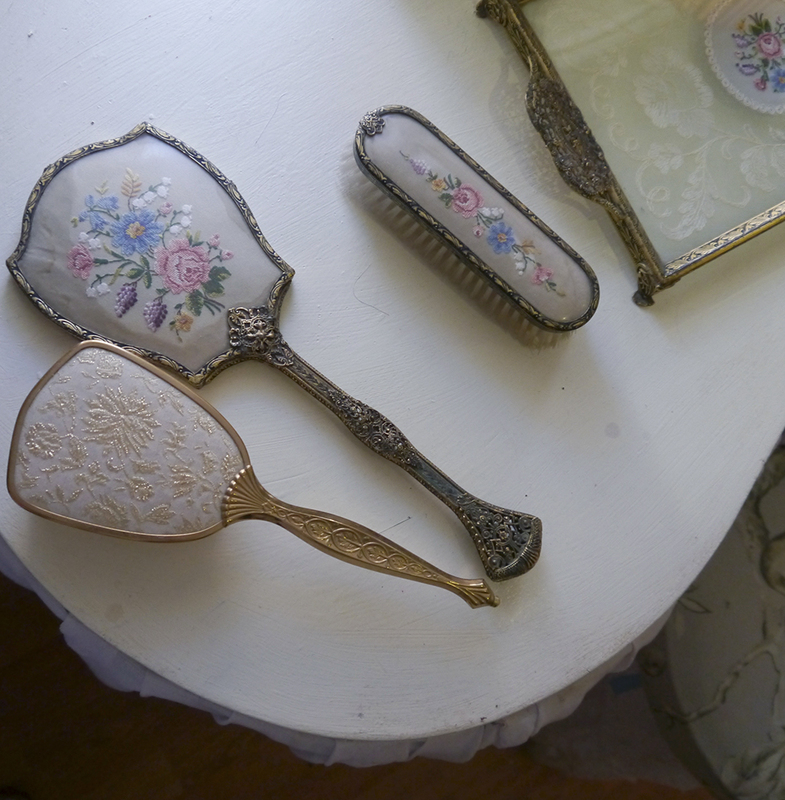 It's kind of like being at your granny's if your gran was utterly fabulous. 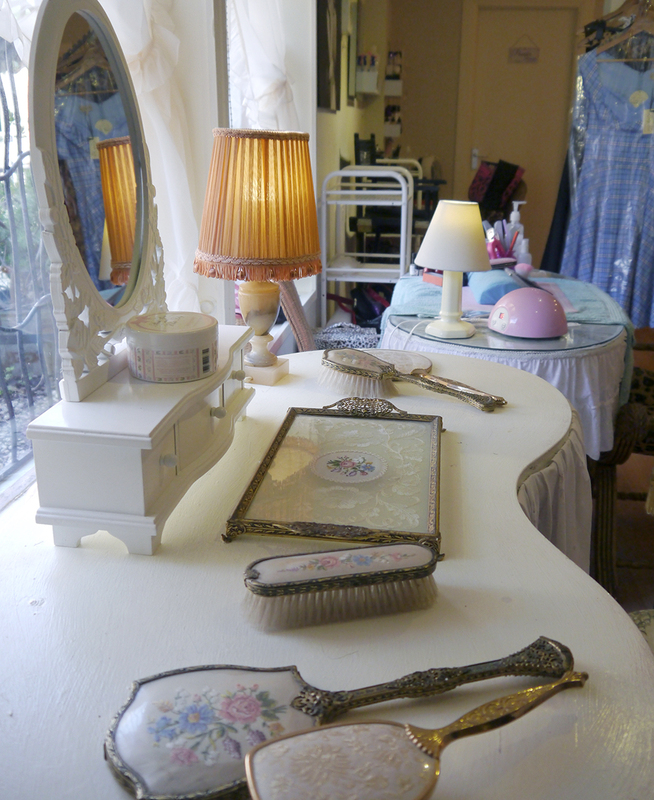 I loved the over the top lace curtains mixed with cool retro touches and plenty of genuine vintage knick-knacks. Upon arrival, we were given a warm welcome by stylists Mandi and Rebecca, who both looked fantastic in their pink dresses and spectacular up-dos. 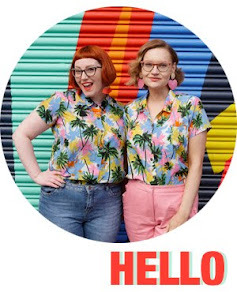 Their authentic vintage style certainly made me feel like we were in good hands. After introductions, teas and coffees and a look from their inspiration books, they got down to business. They primped and prepped our locks to make sure the finished looks would sit perfectly and stay in place, all the time chatting away and having a right good laugh. While our hair set, we each made our way to separate stations: Kimberley to get her make-up done, while I sat down ready to get my nails done. As always happens I was faced with the tough decision of what colour to go with. I always find this part tricky but usually go with the same colour in the end. That's right, it's got to be orange! While my nails were buffed and painted, Kim was getting her face pampered. I have to say I was rather jealous of the results. 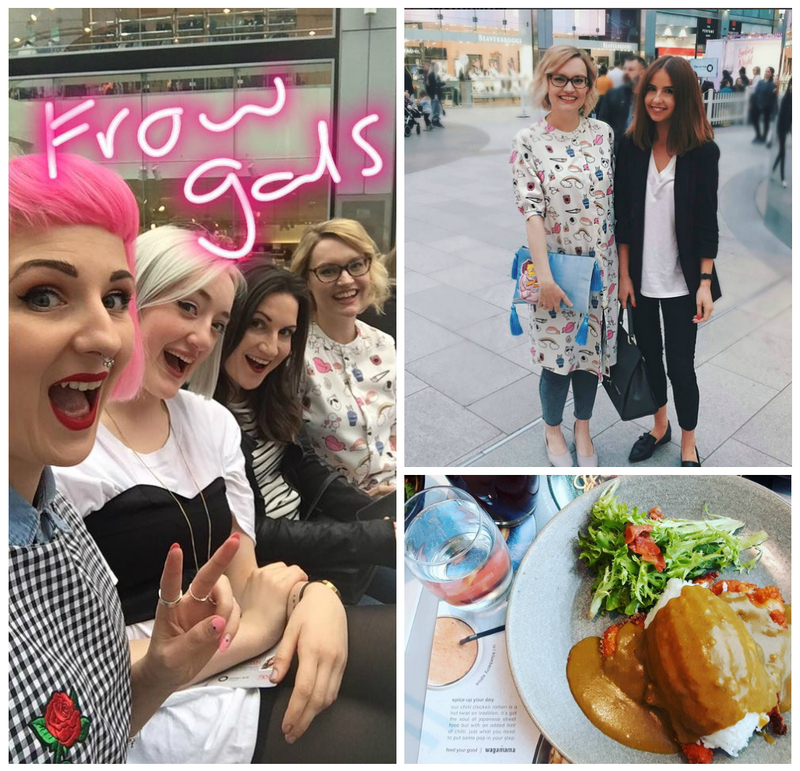 Flicks, sharp brows and classic red lips, oh my! 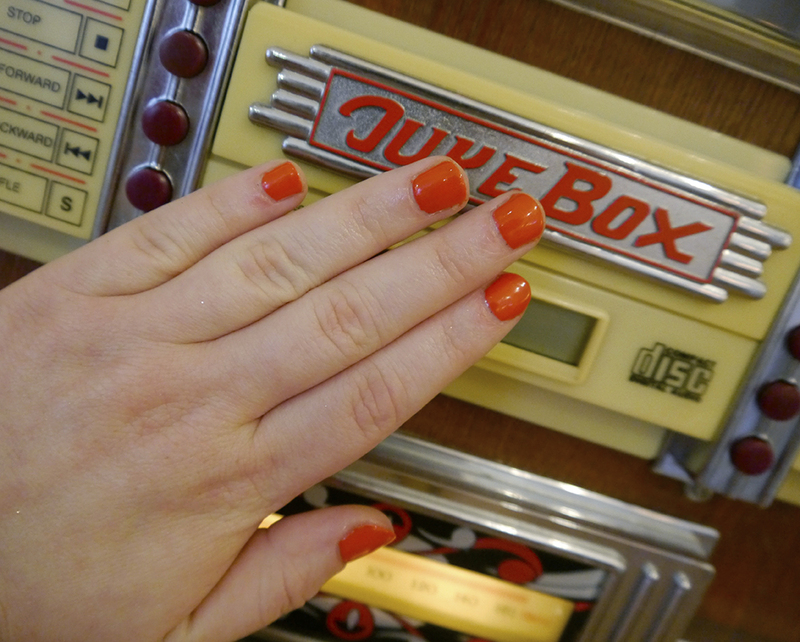 My face felt drab in comparison, but at least my nails looked fab. 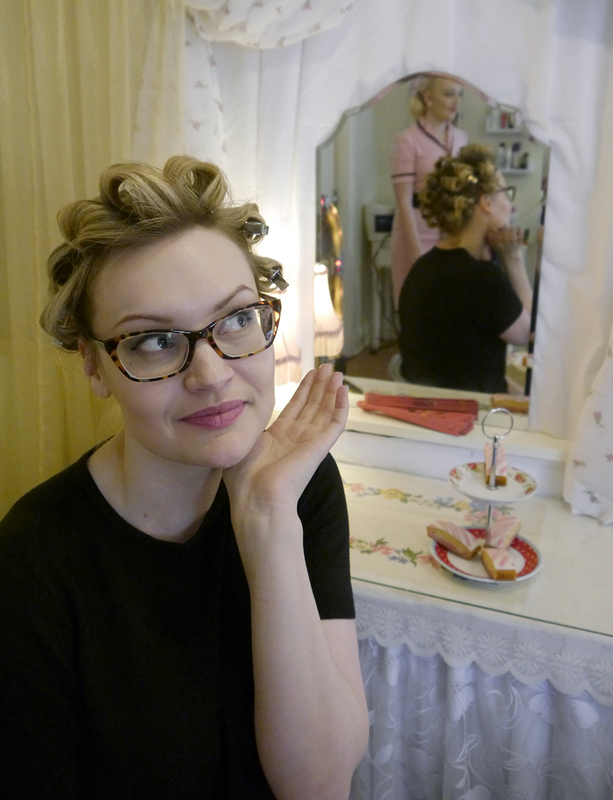 Our hair was then taken from the backcombing stage to perfect vintage pin curls and victory rolls. I always love watching this transformation, it's like some kind of magic! 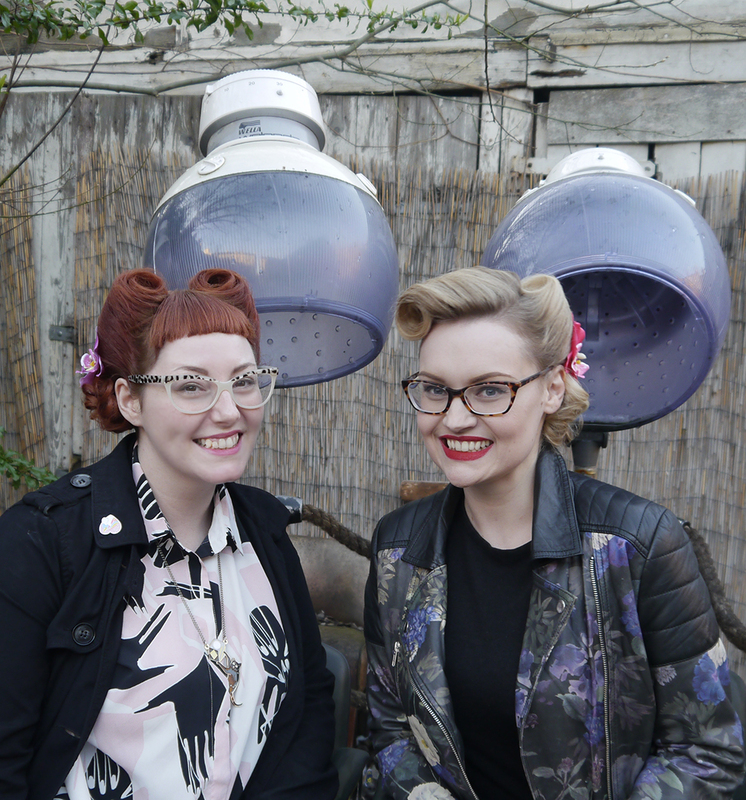 We were both super happy with the results and partook in more than a bit of posing, taking full advantage of the vintage salon chairs outside. It's just a shame we had no parties to go to! We did get plenty of compliments on our journies back home though. I even managed to make my do last to the next day, making my Monday morning feel way more glamorous than usual. I'm pretty sure it would have lasted even longer but I couldn't quite face sleeping with all those kirby grips in for more than one night! 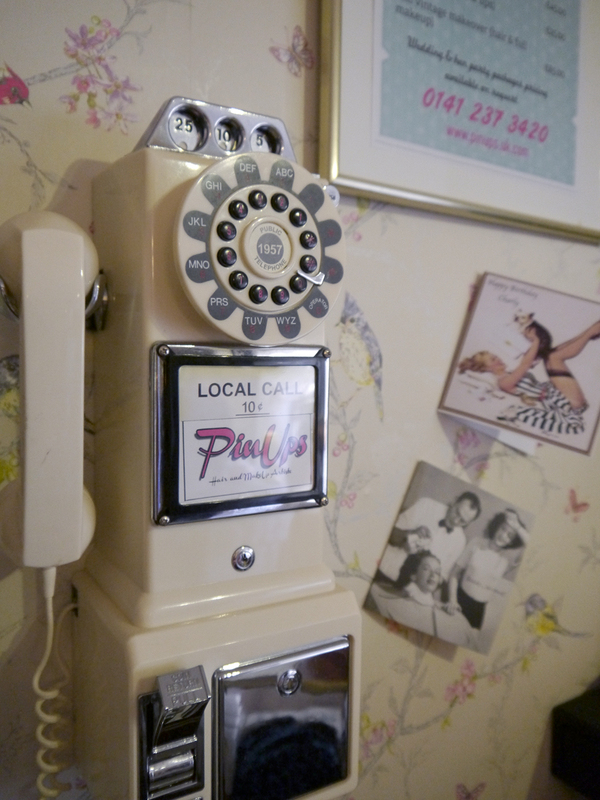 So, if you're in or around Glasgow and looking to add a bit of glamour to your look, PinUps is definitely worth a visit. 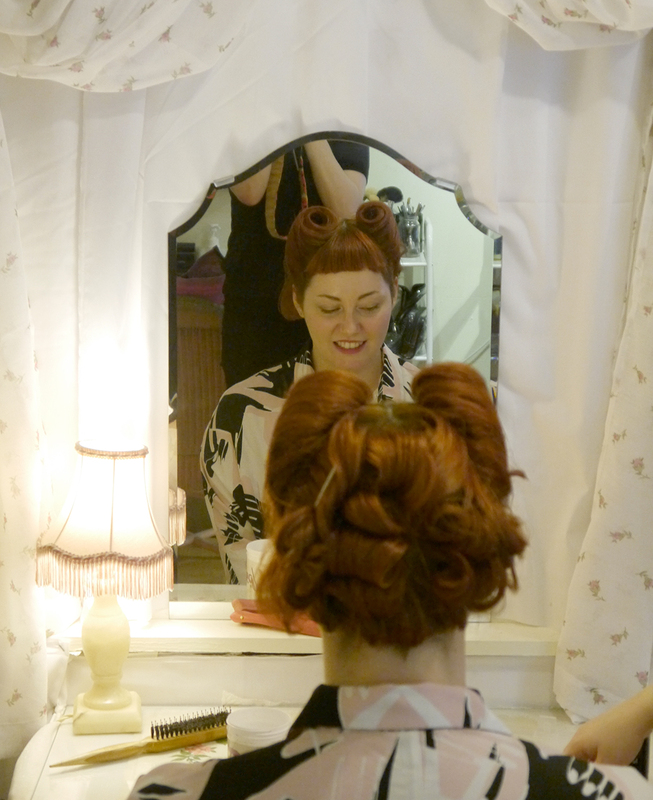 Their salon is a great place to hang out and the perfect venue for a none tacky hen-do, alternative birthday celebration or for bridal parties that want to look fabulously vintage. 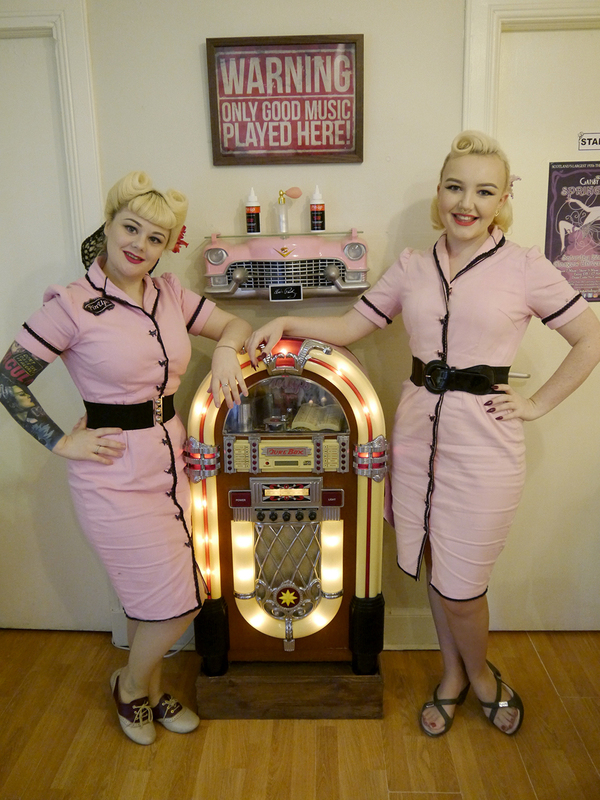 As well as the wee salon you can also find the 'Girls in Pink' popping up all over the place. Check out their Facebook, Twitter and Instagram to follow their adventures. I've certainly enjoyed following them, especially seeing the salon, styling and pink ladies pop up in The Hostiles music video. It's so good! 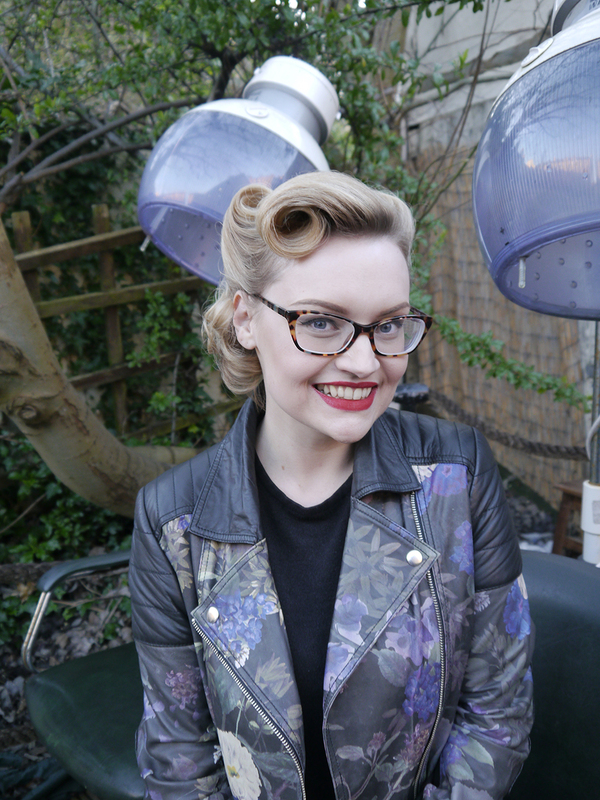 What's your favourite vintage hair style and what occasion would you get a vintage makeover for? Every Cool Girl wears a leather jacket, right? (or faux, these days). This is my first, but I still felt a little out of place putting it on. I bought this jacket back in 2015 but I packed it away when my weight was fluctuating and I really didn't think I'd bring it out again. You see, I've never been The Cool Girl. It just isn't in me. In my head, I'm still the nerdy teacher's pet who did homework in advance and raised her hand for every. single. question. I think that people looking at me now somehow know I once wore those terrible gold rimmed specs and haircuts by my mum. That I was the only girl in my Physics class for three years and the boys didn't even notice there was a girl in the class. That all feels like a hundred years ago, and a whole different person. So why, as a goddamn adult, am I still unable to be cool? Putting on a leather jacket makes me appreciate when other girls say they love my colourful style but "couldn't wear it themselves". Why not, I always ask? Reflecting on it, I now realise. When something is outside our comfort zone we wear it like a costume. 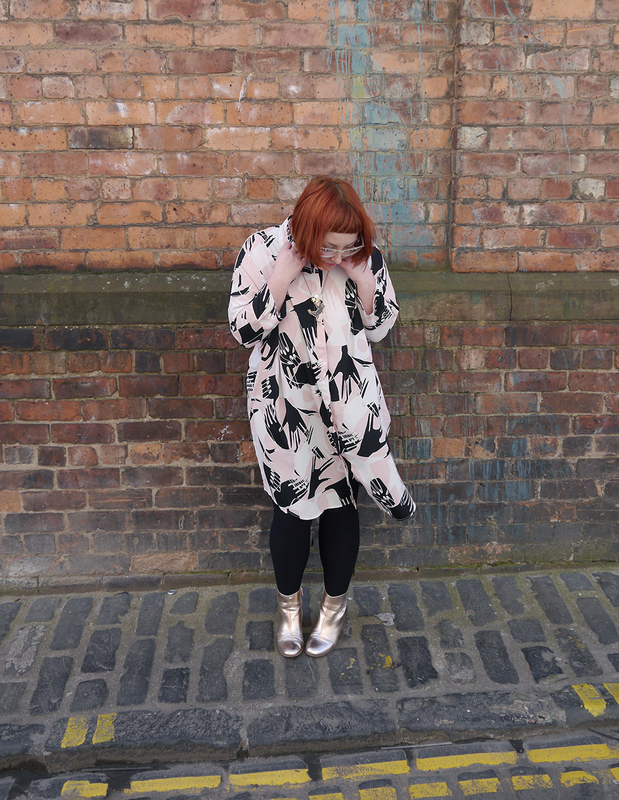 Like a child tottering around in our mum's over sized clothes. And a leather jacket is the cliche; it's what all the distinctly Uncool kids buy when trying to fit in. Trying to be edgy. Rock'n'roll. 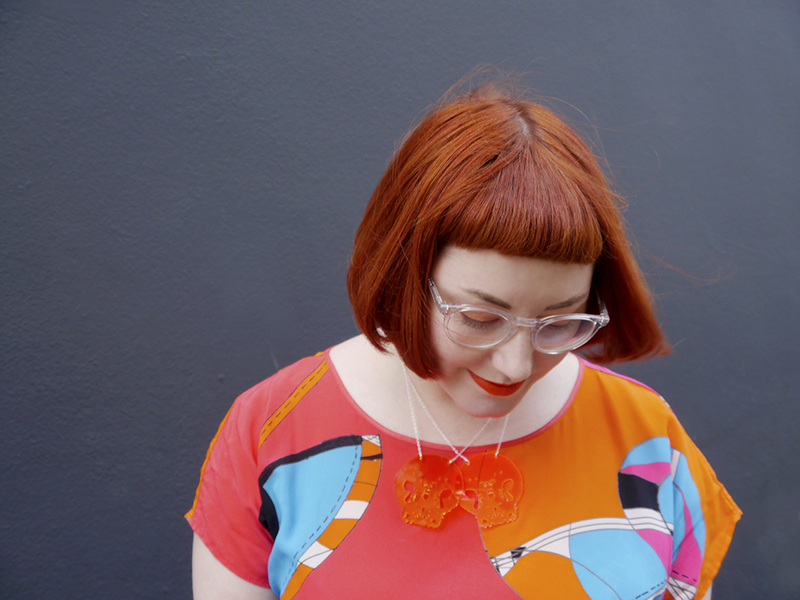 Again, it's an idea lodged in my head that I can do brights, I can wear vintage classics, I can go out dressed like Barb from Stranger Things but something about leather just makes me feel fake. When I found this jacket, I finally found a compromise. The subtle floral print gives it some colour, there's no studded embellishment and it swerves padded biker vibes for feminine silhouette. I wore it on a couple of occasions after buying it and tucked it away again. On pulling it out for the first time this year, I felt much more comfortable throwing it on because it has softened up a bit and it felt worn in and mine. I barely glanced twice in the mirror before I headed out to spend the afternoon with a bunch of bloggers and #GirlBosses at the Sun Jellies event. I received compliments from these much-cooler-than-me girls, so I guess I don't stick out so much after all. 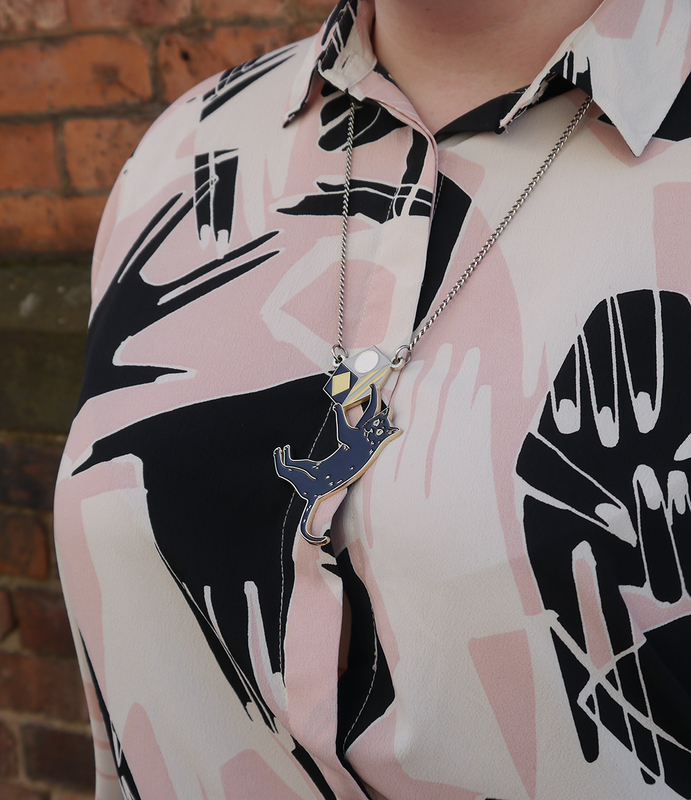 That's the thing about style experimentation: it's not long before that bold new item slips into your everyday wear and becomes a part of you. What trends do you shy away from? Or how do you overcome them? Buying online has its pitfalls. Colours can look more desirable on screen, fabrics can feel different from what you imagine and getting the right fit can be a nightmare. At least when you're shopping in real life you can see, touch and try on the items before parting with your cash. But sometimes, just sometimes, you make an online purchase that turns out to be even better than your expectations. 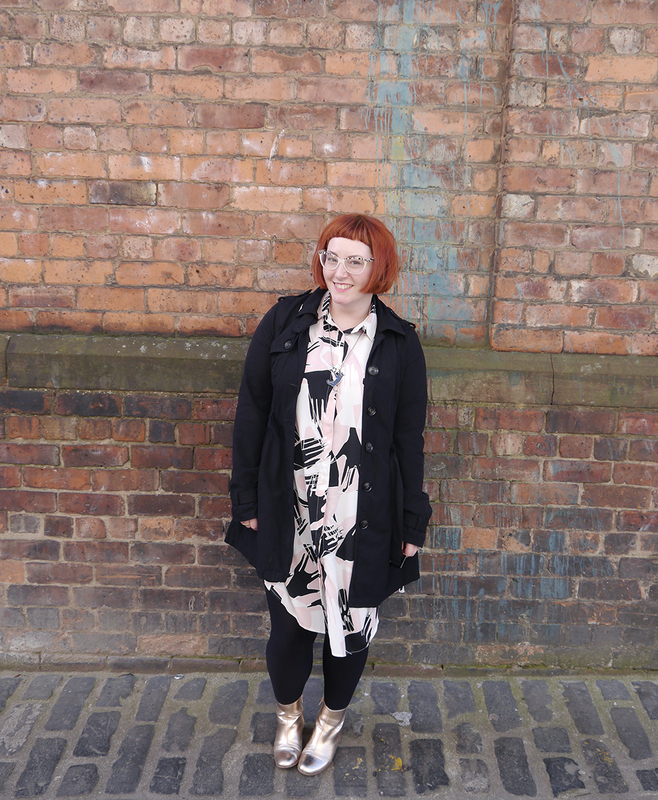 That's what happened when I bought this shirt dress from Monki. I have to admit that I'm a big Monki fan, ever since I bought my eye shirt way back when I've been team Monki all the way. Their fun patterns and prints, easy to wear shapes and affordable prices make the brand very easy to fall for. 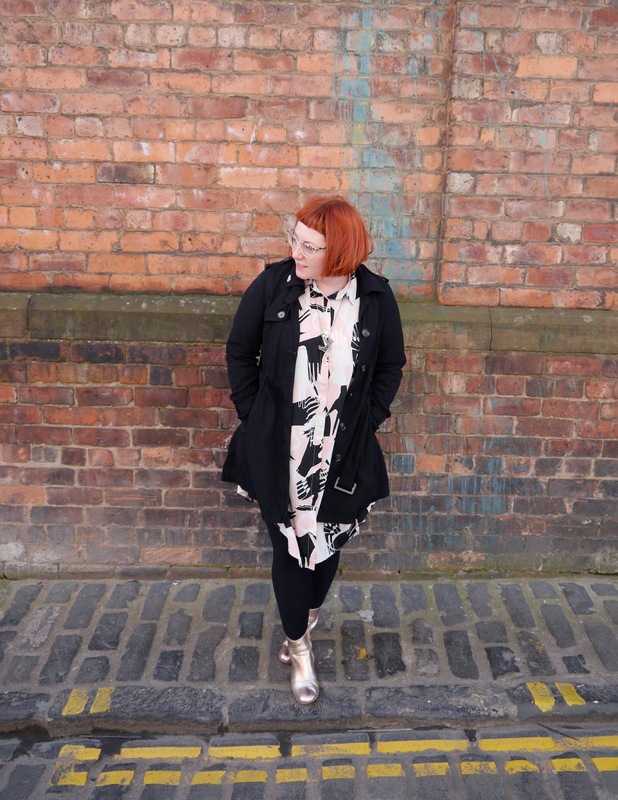 I spotted this shirt dress on Monki's Instagram account and it wasn't long before I added it to my wishlist. I couldn't resist the hand print, so eventually gave in and treated myself. I've loved wearing it ever since. 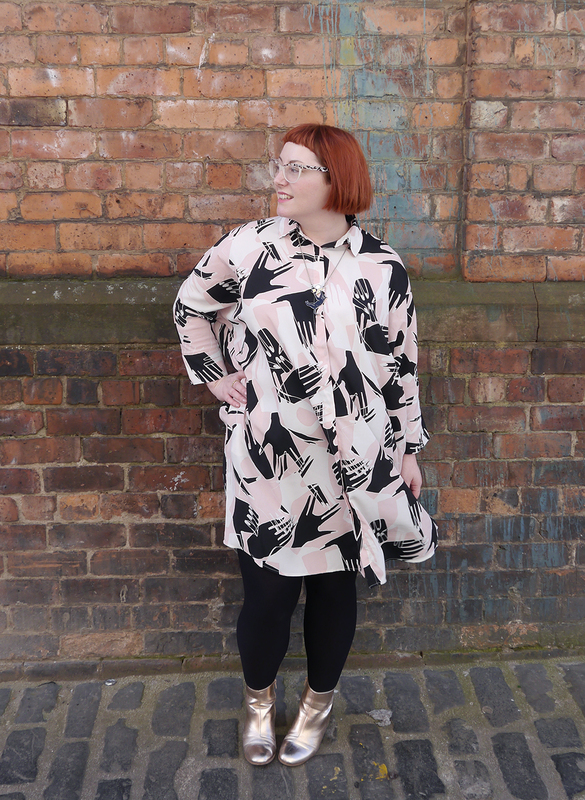 While the shape may not be the most flattering, it is super comfy and a basically just a joy to wear. 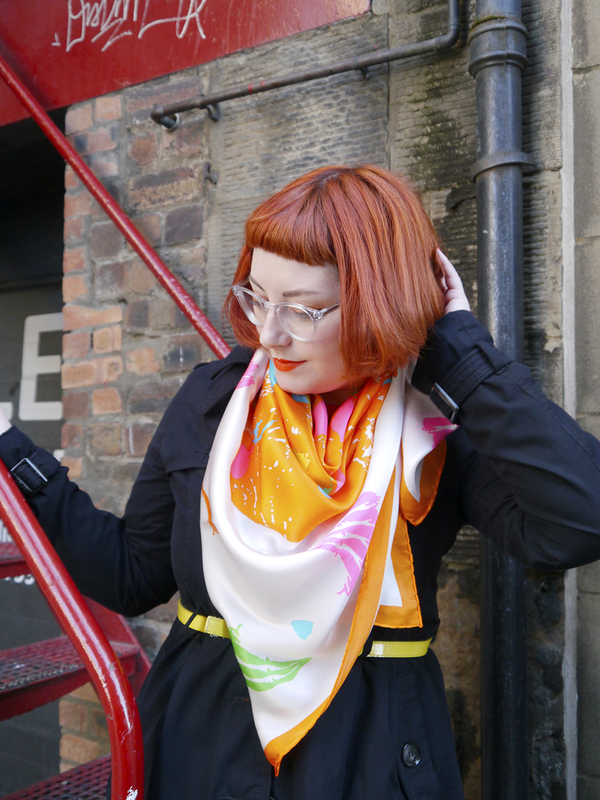 I can throw it on and the pattern still keeps it interesting and makes it look like I've made an effort. Plus, it has pockets! I know everyone loves a dress with pockets and I'm certainly no different. 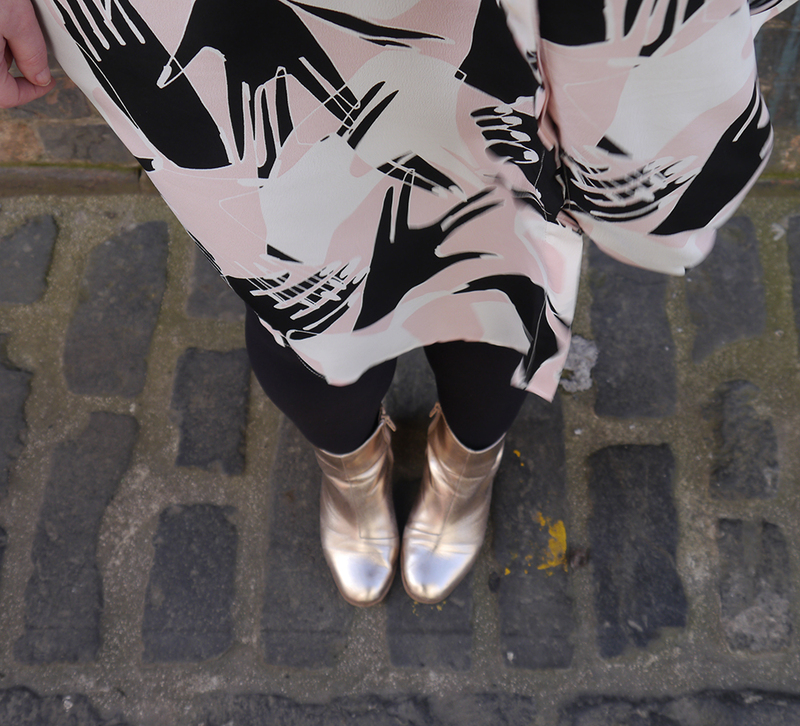 As the print is quite full on I kept the rest of the outfit pretty simple; black tights, black jacket and shiny gold boots. 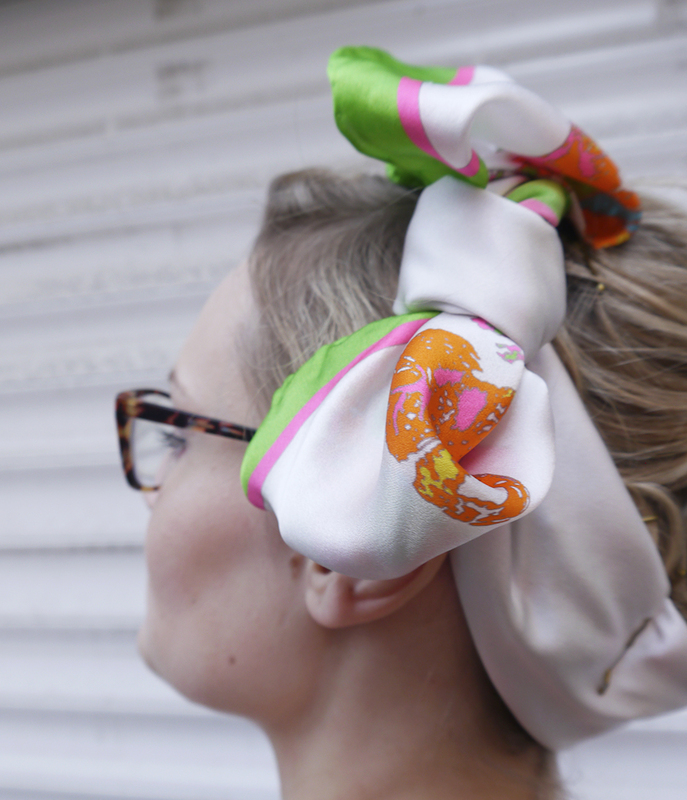 An easy but fun look that was perfect for wearing to the Sun Jellies afternoon tea. The loose shape certainly made room for all those cakes! 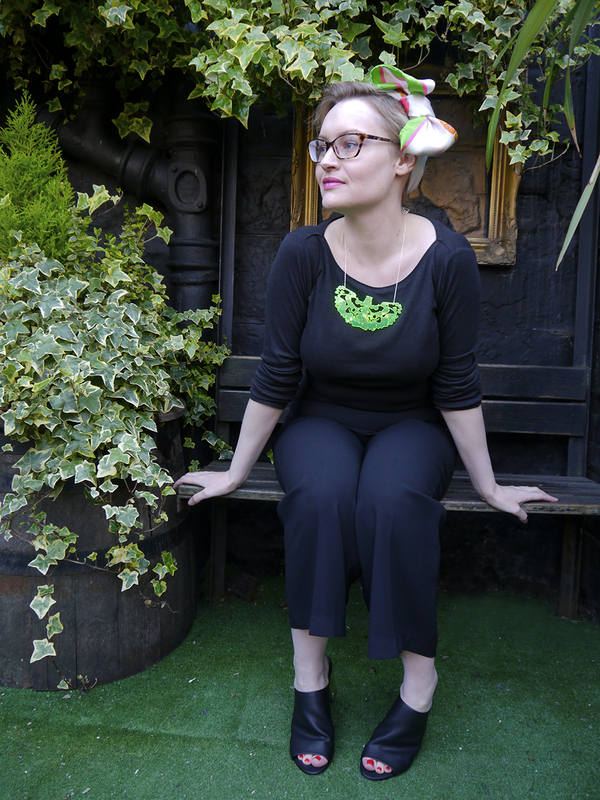 I finished my look off with my Karen Mabon cat necklace, because every outfit benefits from the addition of a cat. Am I right?! 1.) Check out social media. A lot of brands encourage shoppers to share their purchases and outfits on social media. Check out the brands feeds and hashtags to see how the items look on other customers. 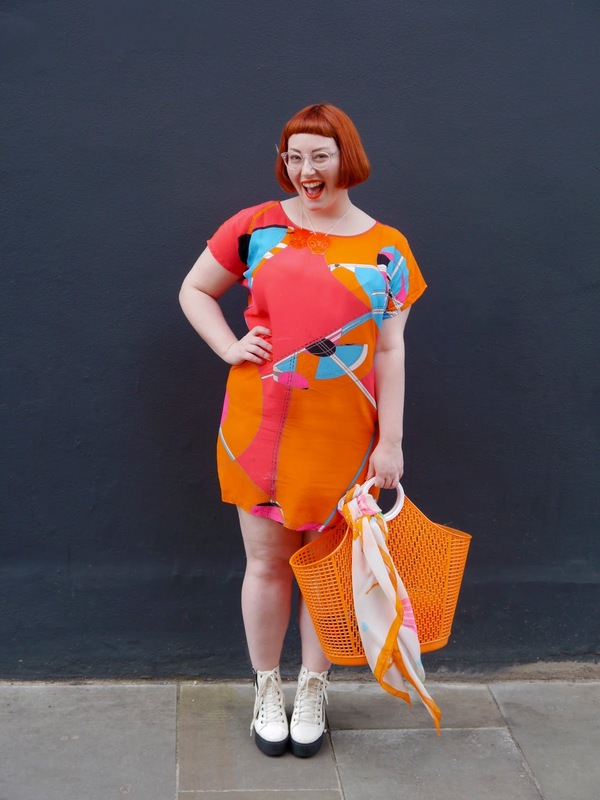 It's all well and good seeing the item in model shots but seeing how it fits different people of different sizes can help to give a better idea of how it will look on you. A lot of sites allow for customers to write reviews of the products or shopping experiences. Give these a read, they can help you get an overall view of the company or give you information on specific items. Just beware of bad reviews that may have been left by customers with unrealistic expectations. Look for ones that provide useful and clear information rather than just ranting. If there isn't a place for reviews on the site, head to Google. There's many times this has helped me decide whether to size up or down depending on feedback from customers. 3.) If it's not right, return it. This is where I'm no good at taking my own advice. I have a dress sitting in my room right now that doesn't quite fit but I'm now out of my window to return it. If you're not happy with the item send it back ASAP! Don't waist time thinking about it or mulling it over, just get it done. Treat it as if you were just trying it on in a changing room. If you would put it back on the rack, go that extra step and post it back. One day I'll learn to do this!